Damask sham with ruched piping. Textural damask pattern. Mocha (Medium Gray), Jade (Light Green), or Bronze (Warm Brown) (listed as shown top to bottom). Brush fringe. Dry clean. Made in the USA of imported polyester. 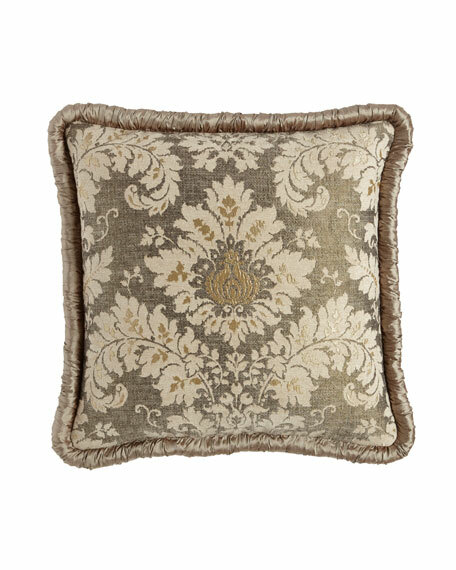 EXCLUSIVELY AT NEIMAN MARCUS Ruched silk velvet pillow with ivory fringe. Hidden zip closure. Front, silk/rayon. Back, polyester. 25"Sq. Dry clean. Made in the USA of imported materials.